Its been a while since I posted some new tools or add ons…. but now I have found some time to update the “Modumat”, one of my first Lemur modules. 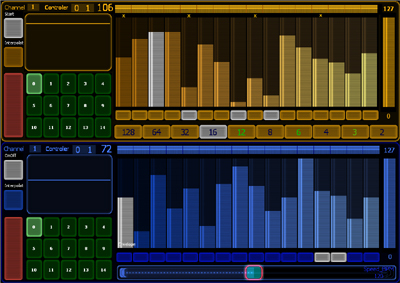 “Modumat” does step modulation of Midi Control Change data on up to 16 steps. This can be linked to any function like filters, velocity, pan or whatever. The modulation can be send stepwise (default) or as a continious line (interpolate). There is a range for the output (e.g. if you only want filter to vary between 34 and 56 instead of 0-127) and a range for the used steps (16 is maximum). The new version6 got also a row of random-switches beneath the sliders – if a switch is activated the corresponding slider will get a new random value shortly after it is triggered. This brings in some variation. As you can control the position of random and the amount of output that is still interpreted by a range, I like to call it “controlled random”. All values can be saved in 15 presets. Saved slots are highlighted. To erase the highlighting press preset 0 and 14 parallel in play mode. This only erases the highlighting, to erase a preset just override it with a new preset. The output can be routed to any Midichannel and controller number by a drop down menu (sending to Miditarget 0 on Lemur). There is a syncronised version (listening to clock input on Miditarget 0) and a unsynced version. Both using only half the screen, so there is enough space to combine it with a small key or a 2nd modumat on one interfacepage. Here is a video from early 2009 which shows one of the first versions of Modumat. It does not contain all features (random switches, presets, Midirouting are missing) but it gives an idea how to use the Modumat.